SRINAGAR: In the back to back two encounters on Monday and Tuesday, six militants were killed in the gunfights between the militants and the counter-insurgent forces at two different places in Chrar e Sharief and Shopian. The similarity between both the encounters was that both happened in hideouts and all the six killed militants belonged to the same belt from Pulwama and Shopian. All the six militants will be buried on Wednesday at their ancestral graveyards: 4 in Shopian and 2 in Pulwama. On Tuesday, the encounter started early morning when a joint party of the army’s 44RR, 23 Para and SOG launched a cordon-and-search-operation in Heff Shirmal village following inputs about the presence of militants. One of the police officers said that the militants opened fire on the army and SOG after several shots of bullets were fired towards their hideout located in a village orchard. “There was a lull momentarily before firefight resumed, leading to the killing of three militants,” he said. Reportedly a soldier was also injured in the Shopian gunfight. “The bodies of the slain were recovered along with many weapons and other arms and ammunition,” said an officer. Reports said the hideout where four militants were trapped was blasted but one of them reportedly managed to flee. However, there was no official confirmation so far. As soon as the encounter started the internet services were suspended in the area as ‘preventive measure’. In immediate follow-up, a number of clashes were reported from the adjoining areas after the news of encounter spread. Reports said that the residents of the area came out of their house and tried to march towards the gun fight site. They pelted stones when they were interrupted by the police and CRPF. This was retaliated by firing teargas smoke shells and pellets. However, there were no reports of any damage during the clashes. Three photojournalists included Waseem Andrabi, Junaid Gulzar, Mir Burhan, and a reporter Nisar ul Haq, received pellet injuries on face and neck when they were covering the gunfight aftermath. All the injured media men were later shifted to a nearby hospital for the treatment. On Monday morning, an encounter broke out between militants and the joint group of army, police and the CRPF including army’s 53 RR and SOG, which continued throughout the day in Zinpanchal forests in Charar-e-Sharief area of Budgam district. The area is a forest area that lies at a distance of one hour from Charar-e-Sharief town and on the other side, it is also near to Pulwama district. As per police, there was a specific input about the presence of militants and when the searches were being carried out in the forest area, the militants who had taken shelter in a hideout from where they opened fire. The forces retaliated, resulting in an encounter at around 7 am. The army’s northern command had already confirmed to the media on Monday evening that three militants were killed. Police took some time to confirm the same. Reportedly, the forces had a tough time reaching the hideout as it was snowing throughout the day and the rough terrain was very slippery. But as the news of the encounter spread in the area, people rushed to help the militants breach the cordon. “However, the forces did not allow them to move forward, resulting in intense clashes,” an officer said. During the clashes, the forces used teargas shells and resorted to aerial firing to disperse the protestors. The three militants killed in Heff Shirmal, Shopian were identified as Shamsul Haq Mengnoo, the brother of an IPS officer. He was the son of Mohammad Rafiq Mengnoo and a resident of Draggud village of Shopian district. Shamsul Haq was pursuing Bachelors of Unani Medicine and Surgery (BUMS) at government college Zakura when he went missing since May 22. His elder brother Inamul Haq is 2012 IPS batch officer who is serving outside the J&K cadre. Shams left home shortly after his house was damaged during an encounter in Dragad on April 01, in which 7 militants were killed. His IPS brother is expected to reach home Wednesday to participate in his funeral, said a family source. Another militant has been identified as Shuaib Ahmad Shah son of Ghulam Rasool resident of Shirmal, Zainpora Shopian. 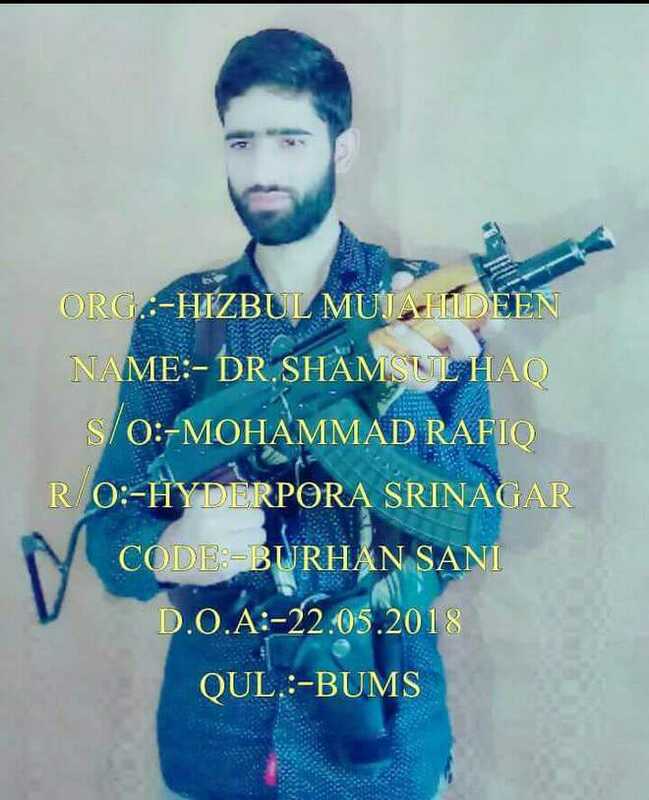 He had joined militant ranks of HM on December 11, 2017. The third militant has been identified as Amir Suhail Bhat son of Abdul Aziz resident of Chidipora Chitragam of Shopian. He had also joined HM militant outfit on September one, 2018. All the three bodies have been handed over to their families from DPL Shopian and were on way to their homes as this report is being filed. “While taking the bodies, clashes erupted near DPL gate between youth and police and some private vehicles were damaged,” informed a local over the phone. The three militants killed in Budgam gunfight were identified on late Tuesday afternoon as Sabzar Ahmad son of Ali Mohammad Mir resident of Lassipora Pulwama, Syed Raban son of Mohammad Hussain resident of Nazneenpora, Shopian and Towseef Ahmad Itoo son of Abdul Aziz resident of Nowpora Payeen Pulwama. “Incriminating material including arms and ammunition were recovered from the site of encounter. All these materials have been taken in the case records for the purpose of the investigation,” said the spokesman. “Bodies of the slain militants were handed over to their families after completion of medico-legal formalities,” he said. Syed Rubaan allegedly joined militant ranks after his family claimed that he was routinely detained by the government forces over the past couple of years. “His detention had become routine and we were cooperating with the government forces. But after he was falsely photographed with AK-47 rifles that actually belong actually to the army, had left us petrified. It happened on June 17,” his brother Syed Tajammul was quoted saying by a local newspaper. It was actually S Tajamul Imran, slain Rubaan’s brother who broke the news of the death of his brother on social media. The second militant identified was Sabzar Ahmad Mir, 20, who joined militant group al Bader on June 27, 218. 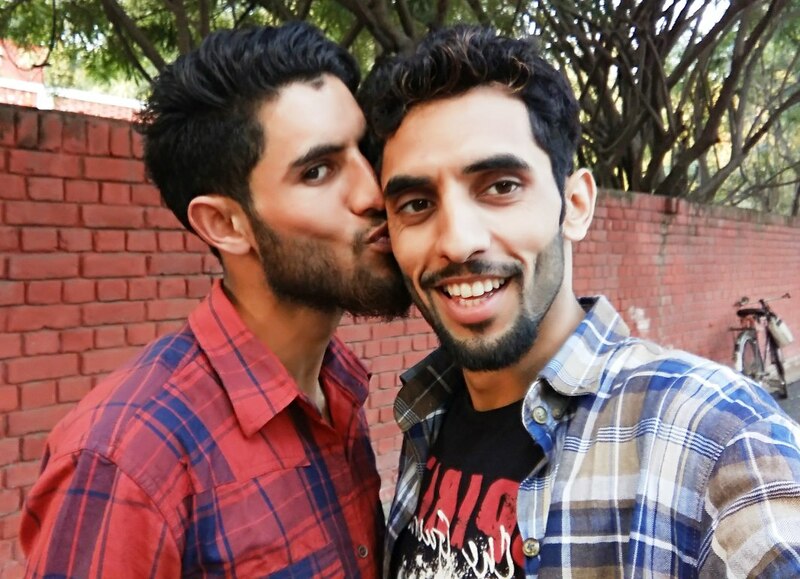 He was presently residing with his divorced mother at their maternal house in Nowpora Pulwama. Before joining militancy he was BA first year student. The third militant identified was Tawseef Ahmad Wani, 24, who had joined militant outfit al Bader on June 03, 2018. He was a class 11th dropout and before joining militancy he was working with poultry. “Apropos our earlier press release regarding the encounter at Shermal, it is further informed that the killed terrorists have been identified as Shamsul Haq Mengnoo son of Mohammad Rafiq resident of Dragad Shopian, Aamir Suhail Bhat son of Abdul Aziz resident of Chidipora Chitragam Shopian, Shoaib Ahmad Shah son of Ghulam Rasool resident of Shermal Shopian. The killed terrorists as per the police records were affiliated with proscribed terror outfit HM and were wanted by the law for their complicity in a series of terror crimes including an attack on security establishments and civilian atrocities. Shoaib Shah according to police records was involved in several terror crime offences and several cases were registered against him including 13/2018 U/S 307 RPC 7/27 A. Act of PS Shopian, 05/2018 U/S 307 RPC 7/27 A. Act 16 ULA (P) of PS Zainpora, 19/2018 U/S 307, 353, 332, 148, 149, 336 RPC 7/27 A. A Act, 16 ULA (P) of PS Zainpora, 42/23018 U/S 307, 393 RPC 7/27 A.Act 16 ULA (P) of PS Zainpora and 52/23018 U/S 307 RPC 7/27 A.Act 16 ULA (P) ¾ Exp Sub Act of PS Zainpora. Similarly, Aamir Suhail Bhat was also involved in several terror attacks. He along with the other terrorists had attacked the residential guard at Chittragam in August 2018 for which a case FIR NO 42/2018 US 307, 393 RPC, 7/27 A Act, 16 ULAP Act is registered at PS Zainpora. According to police records, Shamsul Haq Mengnoo was part of terror conspiracies along with others leading to weapon snatching, recruitment to terror fold, attacks on security forces and so on. Several terror-related cases were registered against him. Incriminating material such as arms and ammunition were recovered from the site of encounter. All these materials have been taken into case records to probe their complicity in other terror crimes. Bodies of the killed terrorists were handed over to their families after completion of medico-legal formalities. Syed Ali Geelani has paid tributes to the militants killed in Budgam and Shopian. While praying his tributes, he said has reiterated that the youth of Kashmir were forced to opt for the gun as a reaction to the forcible presence of the state. Terming Kashmir as a bone of contention between the two nuclear powers of the sub-continent, Hurriyat chairman has regretted that the stubborn attitude of Delhi regarding this globally accepted political dispute and dealing with it only militarily has created death and destruction in the whole state and threatening even the idea of peace and stability of the region. Jammu and Kashmir former chief minister Omar Abdullah condemned the assault on journalists in south Kashmir. Earlier four photojournalists were hit by pellets fired by the forces near the site of the gunfight in Shirmal area of Shopian where three militants were killed in a gunfight. PDP has condemned the brutal assault on photojournalists who were discharging their professional duties in south Kashmir’s Shopian on Tuesday. Former Minister and senior PDP leader Naeem Akhtar while wishing the injured scribes speedy recovery said in a statement that the photojournalists are on the opposite side of the crowd while covering the protests and if the pellets can hit them, they can hit anybody and it indicates a very wanton and indiscriminate use of the weapon.